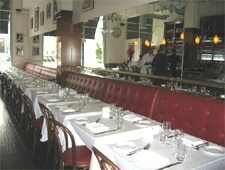 A casual French brasserie in downtown Culver City. : Saint Amour owners Bruno and Florence Herve-Commereuc had the good idea to bring Walter Manzke on board as a consulting chef. 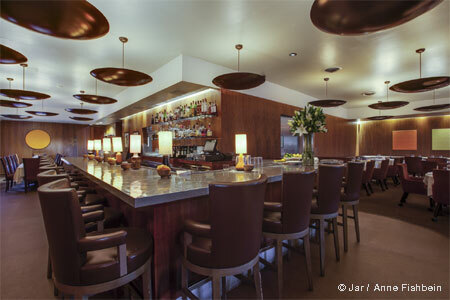 Manzke loves French cuisine, whether it’s fine dining or brasserie style---remember what he did at Church & State? Combining with Bruno’s charcuterie expertise, Manzke plays with a classic repertoire, void of California influence and maintaining French authenticity. Start with the traditional soupe à l’oignon and charcuterie plate (house-made by Bruno). Escargots each inhabit an individual mini-dish with garlic and parsley butter sauce, topped by puff pastry. Bruno also makes good merguez, which is served on a bed of couscous; and though, unfortunately, on the evening we went there was no boudin (blood sausage) on the menu, he prepares the best one in town, so if you see it, order it, too. The lardons on the frisée salad were perfectly grilled, and we liked the moules marinières with french fries and Wednesday’s skate wing plat du jour. We also tried the crispy-skinned loup de mer, accompanied with tiny cherry tomatoes. Jidori poulet rôti sat atop peas so fresh and tasty that we ate them one by one. Other typical brasserie dishes include duck confit, steak frites and pied de cochon (pig’s feet) on lentils, but this one doesn’t need the fried egg. The cassoulet here is a lighter, vegetable version. An assortment of five cheeses, French, of course, is available for $18. Don’t hesitate to order the crème brûlée or chocolate pot de crème. The short wine list emphasizes French wines. If you dine indoors, you will do so at white linen-topped tables along a red banquette topped by brass railings.